The constitutional lawyer made the call while reacting to the ruling of Justice Jude Okeke of the FCT High Court which dismissed all the corruption charges preferred against Ademola by the federal Government. In a statement he personally signed, Ozekhome said the apology should also be extended to Ademola’s wife, Olabowale, and a Senior Advocate of Nigeria, Joe Agi, who were involved in the trial with the embattled judge. Ozekhome appealed to the National Judicial Council, NJC, to immediately recall Justice Ademola back to the Bench and the Lagos state government should also recall Ademola’s wife back to her post. 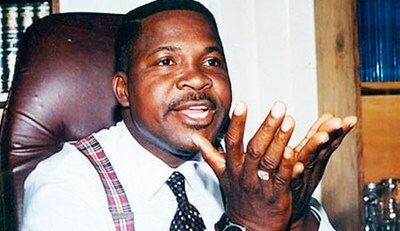 In the statement titled: “The discharge of Justice Niyi Ademola, Wife and Joe Agi, SAN; Matters Arising,” Ozekhome said the discharge of the accused persons based on their no-case-submission, was “an obviously laughable and anti-climax after all the “gra gra”, grand standing, posturing, rabble rousing and wanton degradation of the judiciary by their transducers”. The statement reads, “This discharge, after the horrific humiliation of Justice Ademola, whose home was savagely invaded by rampaging, masked and hooded DSS operatives, between the ungodly and unholy hours of 12 mid night to 5am! Windows and doors were bestially broken down and the Judge whisked off like a common criminal inside a pick up van. “We were told to shut up, not to complain, because the government was fighting the monster called corruption. Never mind that the inner corridors and dark recesses of the same government reek and stink of putrid and horrendous corruption, with the very government rising up on each occasion to defend its corrupt officials. “A case of wanting to sweep your neighbour’s house clean when your own house is dirty and stinking. A clear case of attempting to remove the mole from your neighbour’s eye when a log is embedded in yours. “Justice Ademola was forced to abdicate his judicial functions. It was argued by the anti- corruption revisionists and tyrannical dictators led by the never accountable Presidential Anti-Corruption Advisory Committee (that has since usurped the powers of the Attorney General of the Federation under section 174 of the 1999 Constitution and who are using the anti corruption mantra to settle scores and overwhelm and suffocate opposition, dissenting voices and critical segments of the society, that the DSS could never err. “They stood logic on its head, bastardised the Constitution and our corpus juris.They even extended DSS’s internal security functions to include fighting corruption, if need be, in our matrimonial bedrooms and breaking down houses of suspects who did not even resist arrest. “Justice Ademola ‘s wife was promptly sacked as Head of Service of Lagos state government. They were convicted and punished them unheard. Even God Himself, being ever so omniscient and omnipotent, did not do that to Adam and Eve in the Garden of Eden, notwithstanding that He had already seen them committing the offence of eating of the forbidden fruit. “He still gave them a fair hearing before punishing them. Justice Ademola and other judges of the Supreme Court were tried and convicted in the media by the DSS and EFCC and adjudged guilty in the Court of public opinion,even without trial. “The Anglo-Saxon criminal justice system which is accusatorial, ie, presumption of innocence, rather than guilt, was discarded for the French model which is inquisitorial. “We were inundated with outright lies and shameless falsehood that the DSS could never err because it was fighting corruption. The same DSS is now being crudely vilified by the same anti-democratic, anti-rule of law elements for indicting Magu twice in its damning reports. “Suddenly, DSS is corrupt, lacks integrity and such balderdash. EFCC has shown itself to be an expert in procuring cheap ex-parte injunctions against innocent souls whose accounts and properties are brazenly frozen and attached without the owners’ knowledge. “When the real trial commences, their legal hollowness and emptiness stare them in their opaque and vindictive faces. “Ademola’s discharge without even being called upon to defend himself, is a great and bitter lesson to this government that is fast descending into the abyss of fascism, dictatorship, tyranny and absolutism, through the cheap, self-serving, low quality advice of its minders; that the fundamental rights of Nigerians remain inalienable and inviolable; that the judiciary and rule of law remain necessary indispensable concomitants and corollary adjuncts of constitutional democracy which we operate. “That rule of Law, rather than rule of the thumb and brute force, is what determines the success or otherwise of democracy. “To remove the odious and negative tar of shame, odium and obloquy on these respected members of the society, the EFCC and federal government must make restitution by tendering a public apology immediately to Justice Ademola,his wife and Mr Joe Agi,SAN. “The NJC should immediately recall justice Ademola to commence sitting on the Bench. The Lagos state government should immediately recall Ademola’s wife to her post. “We must be careful not to derail this hard won democracy, which some of us used the best part of our youth fighting for and are still fighting for. “Those currently running and ruining the country were nowhere to be found then. They comfortably hid behind their wives’ backs. Like Roman’s Emperor Nero, they enjoyed and pursued triffles while their country’s edifice burnt”.